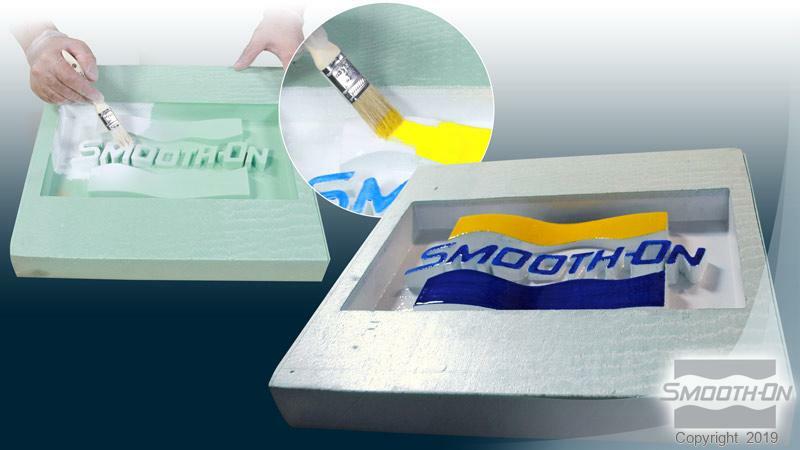 Epsilon™ PRO Product Information | Smooth-On, Inc. Specific Volume 25.0 cu. in./lb. Epsilon™ PRO is a thixotropic epoxy coating that self-thickens for brushing onto a variety of surfaces. 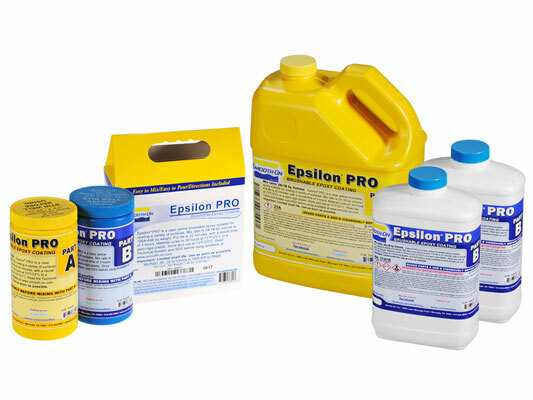 Compared to original Epsilon™, Epsilon™ PRO offers a longer working time and cured epoxy is semi-rigid, offering better impact resistance. Mix ratio for Epsilon™ PRO is 2A:1B by volume (100A:44B by weight). A gram scale is not needed to use this product. Applied in thin layers, mixed material holds a vertical surface without sagging or slumping. Material wets out uniformly over different surfaces. Pot life is 22 minutes, with a re-coat time of 3 hours. All layers should be allowed to cure for 16 hours at 73° F / 23° C and can be accelerated with mild heat. Epsilon™ PRO is clear and can be easily colored using Ignite™ or UVO™ colorants. 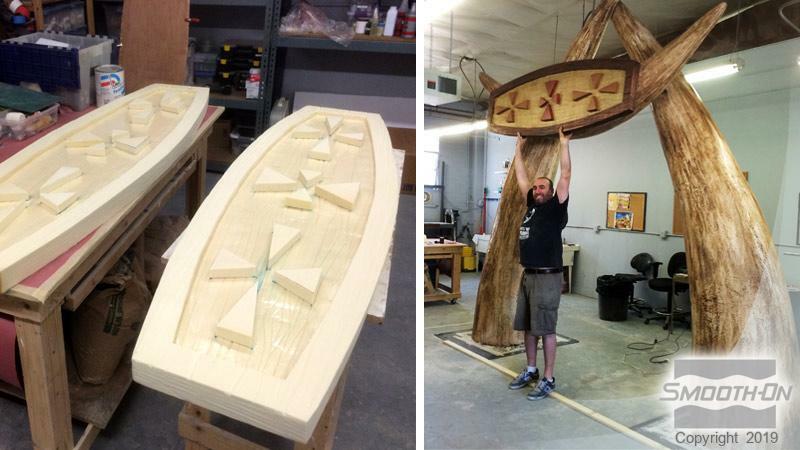 Cured coating has a gloss finish and can be sanded, primed and painted. Applications: Epsilon™ PRO is suitable for use as a protective, impact resistant coating for EPS or polyurethane foam. It can also be applied to plaster, concrete, wood and fabrics. This product is not sensitive to moisture / humidity and contains no VOC’s. Materials should be stored and used in a room temperature environment (73°F/23°C). Elevated temperatures will reduce Pot Life. 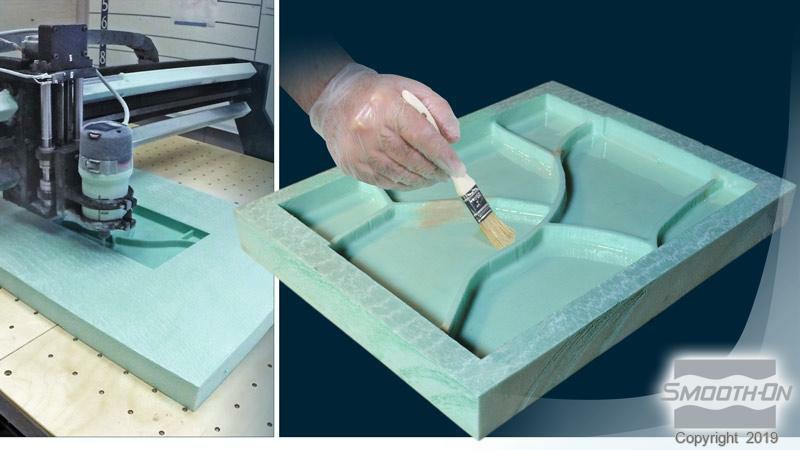 Epsilon™ PRO Part A resin and Part B Hardener must be properly measured and thoroughly mixed to achieve full, high-strength, solid-cure properties. Mixing sticks should be flat and stiff with defined edges for scraping the sides and bottom of your mixing container. Because no two applications are quite the same, a small test application to determine suitability for your project is recommended if performance of this material is in question. Measuring and Dispensing – Stir or shake Part A and Part B thoroughly before dispensing. Accurate ratio measurements by weight are required for the material to cure properly and develop full physical properties. Dispense proper proportions of parts A and B into clean plastic, metal or wax-free paper containers. Mixing – Do not use foam or glass mixing containers. Be sure mixing utensils are clean and free of any potential contaminants such as dirt, dust or grease. Mix Parts A and B thoroughly for at least 3 minutes with a square edged mixing stick. Be aggressive and scrape sides and bottom of mixing container several times. Use the square edge of mixing stick to bring material off of the sides of container and blend. If using a drill mixer, follow with hand mixing as directed above to ensure thorough mixing. NOTE: Pot life can be extended by pouring mixture into a shallow pan, reducing its mass. Important - Mixed Epsilon™ PRO Resin with PART B Hardener is exothermic, meaning it generates heat. A concentrated mass of mixed epoxy in a confined area such as a mixing container can generate enough heat to melt a plastic cup, burn skin or ignite combustible materials if left to stand for its full Pot Life. 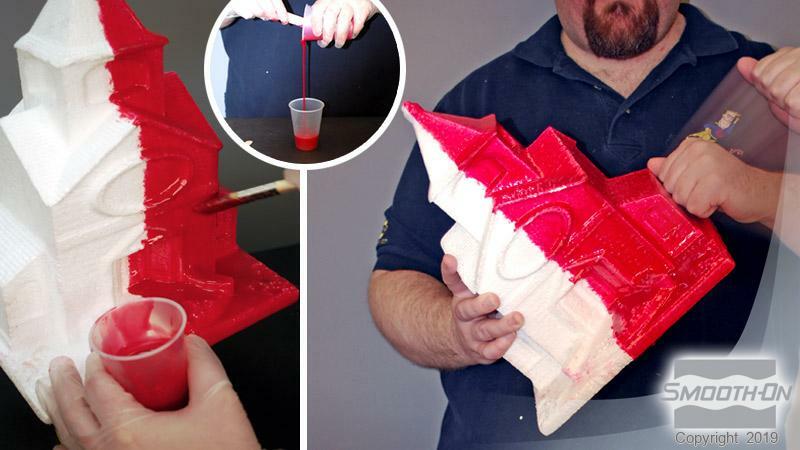 If a batch of mixed epoxy begins to exotherm, move it outdoors to an open air environment. 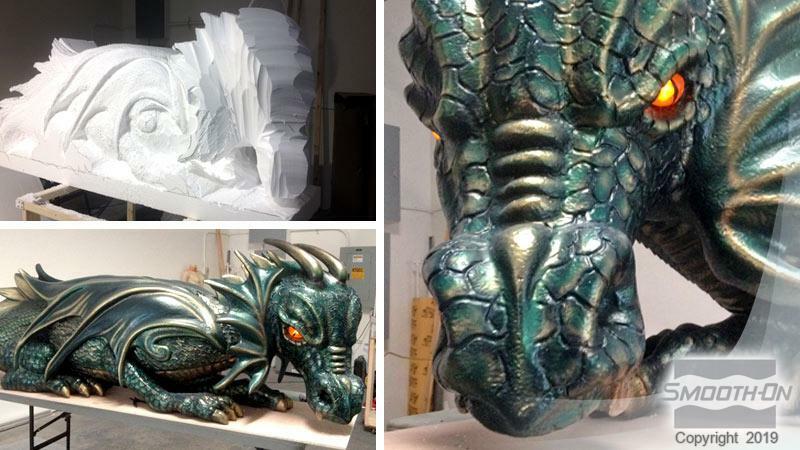 Adding Color - Epsilon™ PRO Epoxy Surface Coat System can be colored with UVO™ or IGNITE™ colorants (from Smooth-On). Pre-mix colorant with Part A thoroughly and then add Part B.
Thickening Epsilon™ PRO - Adding Ure-fil™ 9 (fumed silica) to Epsilon™ PRO creates a creamy, easy to spread and smooth paste which is perfect for filling seams, repairing small dents & divots in foam or smoothing rough areas on EPS foam surfaces. Adding Ure-fil™ 11 (short strand fibers) will yield a slightly thicker paste for better vertical surface hold-ability. Mixture can be used to build up surfaces quickly or to add texture. Also good for filling larger holes or areas that need reinforcement. Recommended: start with a mix ratio of 2 Parts A to 2 Parts Filler to 1 Part B. The amount of filler can be increased or decreased based on application requirements. 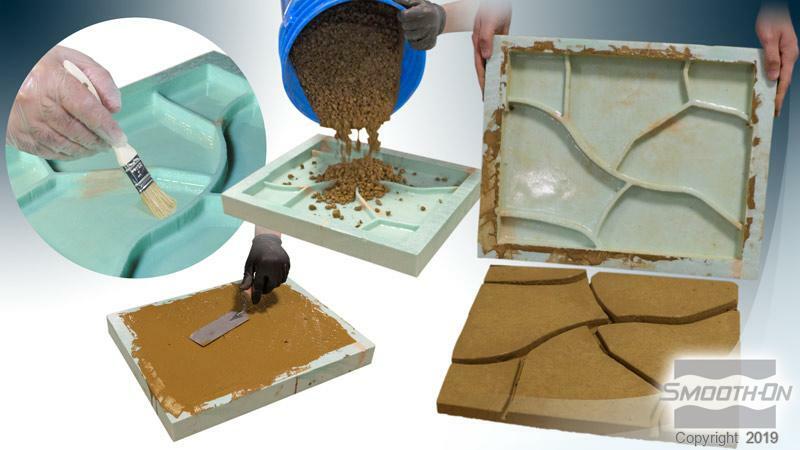 Extending Working Time – mixed material in a deep mixing cup or bucket will set up quickly due to concentration of the liquid mass. Pour mixture into a flat (shallow) metal cookie sheet or baking pan and dispense product from there. Working time will be extended. Apply In Thin Layers - two thin layers of Epsilon™ PRO are recommended for a smooth, uniform coating. Using chip brush or roller, apply 1st thin layer to surface and let epoxy partially cure until “tacky hard”. Apply 2nd thin layer. Allow both layers to fully cure. Important: minimum recommended thickness: 1/16” (0.16 cm). 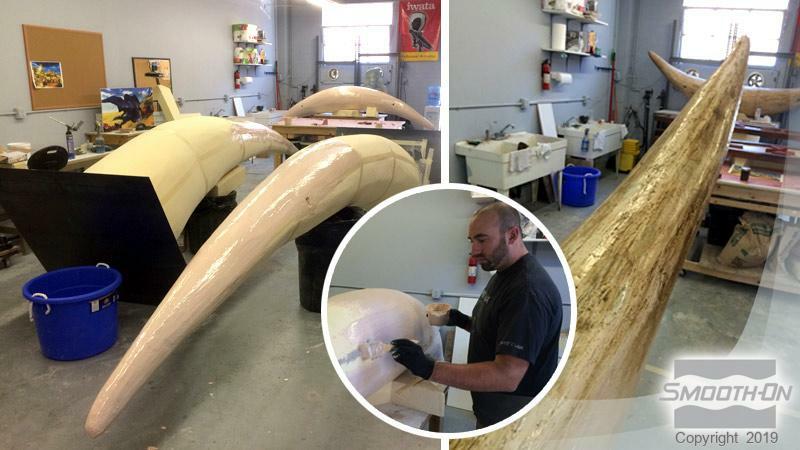 Do not apply epoxy thicker than 1/8” (0.32 cm) per layer as this may cause sagging and result in an uneven cured coating. When coating areas of fine detail, using successive thin layers of Epsilon™ PRO will allow a protective layer of material to be built up without obscuring the detail of the original surface. Cure Time: Refer to the specified “Cure Times” in the “Material Properties” section on front of this Technical Bulletin. Fully cured material will be hard and unable to penetrate with a finger nail. Cured epoxy can now be dry sanded. If machining or sanding, wear NIOSH approved mask to prevent inhalation of particles. Curing - This product will cure at room temperature (73°F/23°C) and does not require heat. 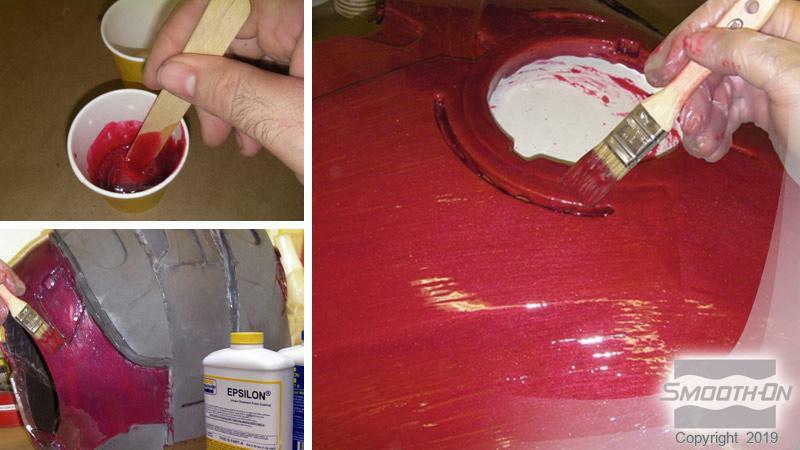 Painting – Epsilon™ PRO can be painted and/or primed and then painted with acrylic enamel paints. Let paint fully dry before putting part into service. For best results, lightly sand surface prior to painting.